Born in 1973, Guillaume Jan works as a reporter for French magazines. Thanks to his profession, he has been a gold seeker in French Guiana, shared the daily life of young Iraqis under Saddam Hussein’s empire, slalomed between mines in Kabul, spent time in the charming village of Al-Qaida in Yemen, followed the teachings of a French guru from Béziers in his Indian ashram, infiltrated a concubines’ network in China, played football with the official Grozny team and snooker with English gangsters. A resident of Paris, in 2009 Guillaume Jan published Le Baobab de Stanley, a bitter-sweet ballad set in the heart of Africa on Stanley’s footsteps. His first novel, Le Cartographe, was published in 2011 by Intervalles to much acclaim. In this one, his third book, he returns to Africa, following in the footsteps of Livingstone this time. While crossing a part of Central Africa, two lovers become lost in a forest, but after finding their way back, they decide to get married in the nearby pygmy village, over a hundred miles after their starting point. 150 years earlier, the zealous missionary David Livingstone had been wandering through the savannah in search of the promised-land, a trading highway or some miraculous springs. Intertwining these two picturesque journeys, Guillaume Jan links the destiny of two Don Quixotes who, each in their own way, give their heart to the Black Continent. The improvised wedding, decided during a chaotic journey, is the narrative backbone of the book. But this passionate love story is also a pretext to describe in detail and with humour the unbelievable daily life of the Congolese people. In parallel, the author draws the portrait of Doctor Livingstone. He shows us a lesser-known side of this original, stubborn, clumsy yet dreamy man who gets caught up in Africa to the point where his dying wish was for his heart to be buried there. 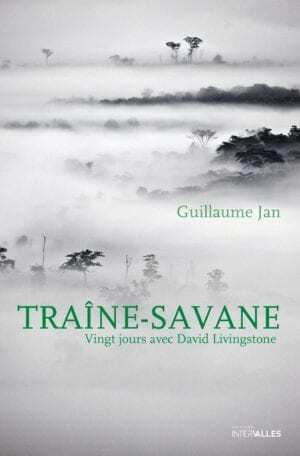 Traîne-savane plunges us into the depths of contemporary Africa. It shares with us the romantic or hallucinated visions of 19th century explorers. It also sheds light on a great explorer, bravely engaged in impossible fights, a man that the British Empire almost forgot, until Stanley found him on the shores of Lake Tanganyika and spoke out his legendary “Doctor Livingstone, I presume…” Strangely enough, no serious biography of the Scottish missionary had ever been written in French before.